a. Problem recognition: The first stage of the business buying process in which someone in the company recognizes a problem or need that can be met by acquiring a good or a service. b. General need description: At this stage of business buying process company describes the general characteristics and quantity of a needed item. 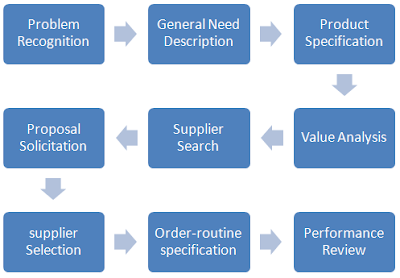 c. Product specification: At this stage of the business buying process buying organization decide on the product and specifies the best technical product characteristics for a needed item. d. Value analysis: An approach to cost reduction, in which components are studied carefully to determine if they can be redesigned, standardized or made by less costly methods of production. e. Supplier search: At this stage of the business buying process buyer tries to find the best vendors. f. Proposal solicitation: The stage of the business buying process in which the buyer invites qualified suppliers to submit proposals. 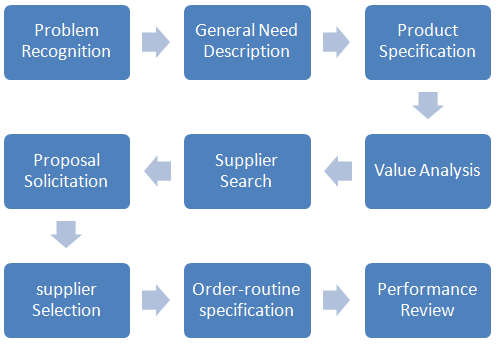 h. Order-routine specification: The stage of the business buying process in which the buyer writes the final order with the chosen supplier(s), listing the technical specifications, quantity needed, expected time of delivery, return policies, & warranties. i. Performance review: The stage of the business buying process in which the buyer rates its satisfaction with suppliers, deciding whether to continue, modifies, or drops them.